Alex wanted to plan the perfect moment to pop the question to Jen. He hired me to document everything, without her knowledge. Considering these two work from home together, planning anything without Jen finding out would prove to be a difficult task! He managed to plan an epic proposal AND their engagement party, all under Jen's nose. Even though our conversations were limited to five minute snippits while Jen was in the shower (and some text messages), Alex managed to fill me in. The couple will be moving from San Diego to New York soon, so the engagement party was planned under the disguise of a going-away party! The couple had reunited on the west coast, after Jen saw a photograph on social media of Alex squatting at the edge of a cliff at Sunset Cliffs Natural Park. Realizing they were both in San Diego, these two re-connected. Alex asked Jen to be his wife on top of the same cliff that brought them back together. He told me it was 'their spot'. He took me there in advance to show me exactly where to go at Sunset Cliffs to get the right angle when he popped the question. On the day of the proposal, Alex told me time was dragging by. As I waited for the couple to arrive, I took some photographs of the landscape at Osprey Point, Sunset Cliffs, since the couple will be moving, I wanted to properly document their spot. A really large storm moved in right as I arrived at the cliffs, and the tide began to rise. Alex and Jen arrived at the cliffs. They took a moment to enjoy the landscape together before Alex got down on one knee and asked Jen to marry him. The crashing waves were an epic backdrop for such a moment. She said yes, and was completely surprised! The rain held off just long enough for us to grab some shots of the couple, after Jen became aware that I was photographing everything. We were lucky enough to catch a double rainbow just moments before it began pouring and I had to run my equipment back to the car. I think the rainbow usually comes after the storm, but then again- nothing in life is predictable. It was truly a lovely beginning for these two! 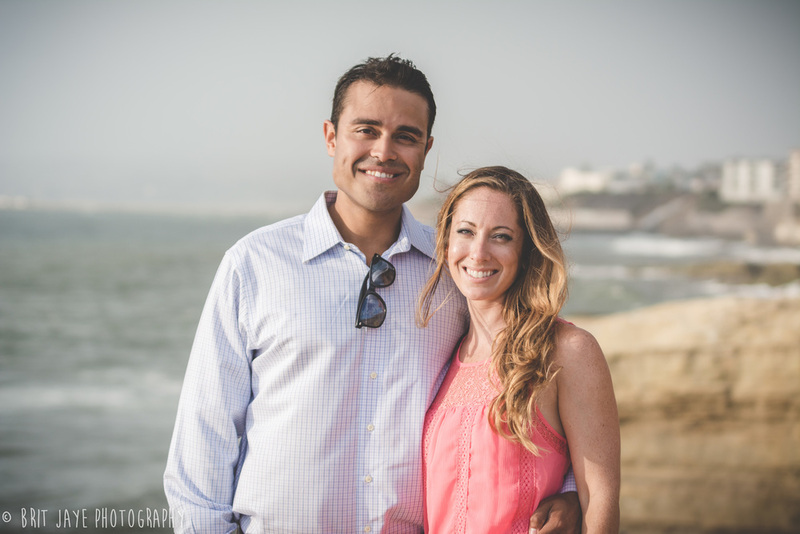 Contact me if you are looking for someone to document your epic San Diego proposal!